This past week we found out about the T.E.A. parties happening all over the USA. 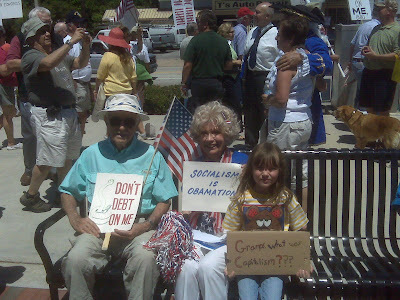 We ended up as a family and friends going to downtown Deland, FL to join the protest. WHY? Because I am not in favor of the way our President and congress are handling the financial situation in America. One of the speakers today said in America we as Americans are concerned about this taxation overload becuase of the money, whereas she coming from Cuba being an immigrant are concerned about where this will lead as regards to Freedom. I am not sure of the solutions for our country, but sitting around and complaining is not the answer and wrting and calling leaders is one of many and I believe just getting out among other people who believe the same way is powerful and confirming as well. God help America to stay free as there is no other place left to go after America.